ACC most often occurs in the salivary glands but can originate in the breast, trachea, skin, or other sites. Survival rates at five years are close to 90percent but drop significantly after that with just 40percent surviving at 15 years after diagnosis. It is a slow-growing cancer that affects about 1,200 people each year, with few symptoms in early stages. SCOTTSDALE, ARIZ.—Most recurrences of HPV-positive oropharyngeal squamous cell carcinoma (OPSCC) can be found through imaging and physical exams within six months after treatment, according to a study from the H. Lee Moffitt Cancer Center & Research Institute in Tampa, Fla.
“For most patients with HPV-associated oropharyngeal cancer who have had a negative three-month PET scan, physical exams with history and direct visualization are sufficient to find recurrences,” said Jessica M. Frakes, MD, Assistant Member of the Department of Radiation Oncology at the institute and lead author on the study, in a presentation at the 2016 Multidisciplinary Head & Neck Cancer Symposium. “Minimizing the number of exams that do not compromise outcomes not only helps decrease anxiety and stress for our patients, but also eases the financial burden of cancer care,” she said. The study also supports the effectiveness of specialist teams in treating HPV-positive OPSCC with definitive radiation therapy. Frakes said local control at three years was 97.8; regional control 95.3 percent; locoregional control 94 percent; and freedom from distant metastases 91.4 percent. Three-year overall survival was 91 percent. “The number of OPSCC patients and survivors is growing, so there is a great need to determine the general time to recurrence and the most effective modes of recurrence detection in order to guide optimal follow-up care,” Frakes said. But National Comprehensive Cancer Network (NCCN) guidelines for treatment of OPSCC are “one size fits all,” she said, with the same follow-up recommendations whether the disease is HPV-associated or not. To identify patterns in recurrence detection, the researchers examined 246 cases of HPV- or p16-positive non-metastatic OPSCC patients treated with definitive radiation therapy at Moffitt between 2006 and 2014. Of those, 84.6 percent received radiation therapy and a concurrent systemic therapy, and 15.4 percent received definitive radiation therapy alone. Patients then underwent a PET/CT scan three months after completing treatment. They also had physical exams every three months in the first year following treatment, every four months in the second year, and every six months in years three through five. Median follow-up care length for all patients was 36 months. Recurrence and survival rates were calculated from the end of radiation therapy. “Our local control was excellent,” Frakes said, reporting 98 percent of local failures were detected by physical exam, with either direct visualization (two cases) or flexible laryngoscopy (four cases); 89 percent of regional failures were found due to symptoms—primarily a neck mass—or by three-month post-treatment imaging; and 71 percent of distant metastases were found due to symptoms or three-month post-treatment imaging. Frakes described some disease characteristics that increased the likelihood of recurrence: patients with five or more nodes or with level IV low-neck nodes present were more likely to suffer regional failure; and there was increased risk of distant metastases with involved lymph nodes greater than 6 cm (N3 disease), bilateral lymph node involvement, five or more involved lymph nodes, or level IV lymph nodes. Toxicity rates were low, she said, with only 9 percent of patients experiencing severe late side effects. “And the majority of those patients had resolution of the side effects at the time of last follow-up, meaning the feeding tube was taken out or they were treated with hyperbaric oxygen for necrosis,” she said. Sixty-four percent of toxicities and/or recurrences occurred within the first six months following treatment, and only four events occurred more than two years following treatment. “We were pleasantly surprised by the high cure rates and the low permanent side effect rates for these patients,” Frakes said. These findings show individuals with HPV-associated oropharyngeal cancer treated with definitive radiation therapy and cared for by multidisciplinary specialists have excellent outcomes, Frakes concluded. Surveillance: Too Much or Too Little? There is much debate as to whether whether the surveillance done for the HPV-positive subset of OPSCC is too much or too little, said Bhishamjit S. Chera, MD, Associate Professor and Director of Patient Safety and Quality in the Department of Radiation Oncology, University of North Carolina Hospitals, Chapel Hill, who was asked to comment on this study for OT. Chera said repeated imaging, such as with PET/CT every 3-6 months, is not likely to detect recurrences faster in these patients, and it would clearly be more costly. He said future studies should evaluate following these favorable prognosis HPV-positive OPSCC less often. Christine G. Gourin, MD, Associate Professor of Otolaryngology-Head and Neck Surgery, Sidney Kimmel Comprehensive Cancer Center, Johns Hopkins Medical Institutions, Baltimore, and moderator of an online/audio preview of this meeting for the press, said she appreciated the Moffitt study’s findings. Gourin said her institution has stopped routinely imaging patients after three months if a PET scan is negative. 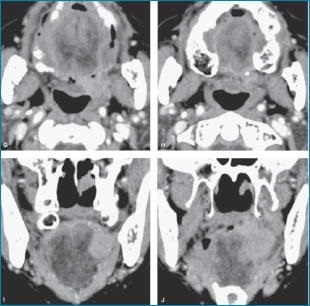 Posttreatment imaging at 3 months and physical examinations during the 6 months following treatment can detect most recurrences in patients treated with definitive radiation therapy for oropharyngeal cancer caused by human papillomavirus (HPV).1 This research was presented at the 2016 Multidisciplinary Head and Neck Cancer Symposium. A dramatic increase in oropharyngeal squamous cell carcinoma (OPSCC) cases associated with HPV has been reported by the American Cancer Society. Survival rates after definitive radiation therapy have also increased. This has led to the need to determine general time to recurrence and the most effective modes of recurrence detection, to guide standards for optimal follow-up care by oncology teams. This study examined 246 cases of HPV-positive or p16-positive non-metastatic OPSCC treated with definitive radiation therapy at a single, large-volume cancer center between 2006 and 2014. Follow-up care included a PET/CT scan 3 months after completing treatment and physical examinations every 3 months in the first year following treatment, every 4 months in the second year and every 6 months in years 3 through 5. Median follow-up care length for all patients was 36 months. Patient outcomes, including recurrence and survival rates, were calculated using the Kaplan-Meier method from the end of radiation therapy. Most recurrences were detected either by persistent disease appearing on 3-month post-treatment imaging or by patients presenting with symptoms at follow-up examinations. Disease characteristics that increase the likelihood of recurrence include presenting with 5 or more nodes or having level 4 lymph nodes (P < .05). Distant metastases were a greater risk in patients with a lymph node larger than 6 cm or with bilateral lymphadenopathy (P < .05). “For most patients with HPV-associated oropharynx cancer, after a negative 3-month PET scan, physical exams with history and direct visualization are sufficient to find recurrences,” said Jessica M. Frakes, MD, an assistant member of the department of radiation oncology at the H. Lee Moffitt Cancer Center in Tampa, Florida, and lead author in the study. “Minimizing the number of unnecessary tests may alleviate the financial and emotional burden on these patients, including overall health care costs, time spent away from work and family, and the anxiety of waiting for scan results.” This study also supports the effectiveness of specialist teams in treating HPV-positive OPSCC with definitive radiotherapy (RT). Within 3 years, local control was achieved in 97.8% of all patients in the study; regional control in 95.3%; locoregional control in 94%; and freedom from distant metastases in 91.4%. The 3-year overall survival rate was 91%. “We were pleasantly surprised by the high cure rates and the low permanent side effect rates for these patients,” said Frakes. “These findings demonstrate that individuals with HPV-associated oropharyngeal cancer who are treated with definitive RT and cared for by multidisciplinary specialists have excellent outcomes.” Reference: 1. Frakes JM, Naghavi AO, Strom T, et al. Detection of recurrence in HPV associated oropharynx squamous cell carcinoma. Presented at 2016 Multidisciplinary Head and Neck Cancer Symposium; Scottsdale, AZ; February 18, 2016. Abstract 6. Quinn, RN, MSN, from the University of Pittsburgh Cancer Institute. Society (ONS) 40th Annual Congress in Orlando, Florida. irradiation experience some degree of oral mucositis. She hopes this study will change that. laser treatment is still cost-effective,” she said. chemotherapy, and helps to reoxygenate the cells, Quinn explained. first patient we treated made it all the way through,” she said. None of the 52 patients treated with LLLT developed any oral mucositis. neutrophil count was above 1000 cell/nm³. unbelievable what the therapy has done for oral mucositis,” Quinn noted. with the probe,” Quinn explained. we do their tongue. The patients love it. We call it their spa time. have had no adverse side effects,” she said. The learning curve is very slight, Quinn added. no experience in its use,” she said. Ms Quinn and Ms Gholz have disclosed no relevant financial relationships. Oncology Nursing Society (ONS) 40th Annual Congress: Abstract 84. Medscape Medical News © 2015 WebMD, LLC Send comments and news tips to news@medscape.net. When it comes to specialized cancer surgery, the more experienced the surgeon, the better the outcome is generally true. The same might hold true for radiation therapy used to treat head and neck cancer, according to a new study. Published in the Journal of Clinical Oncology(1) with an accompanying editorial(2), the study compared survival and other outcomes in 470 patients treated with radiation therapy at 101 treatment centers through a clinical trial held from 2002 to 2005. The trial was sponsored by the National Cancer Institute and organized by the Radiation Therapy Oncology Group (RTOG). It was conducted by researchers at The Ohio State University Comprehensive Cancer Center – Arthur G. James Cancer Hospital in Columbus. The findings indicated that patients treated at the less-experienced centers were more likely to have cancer recurrence compared with highly experienced centers (62% vs 42%, respectively, at 5 years) and had poorer overall survival compared with those at the highly experienced centers (51% vs 69% 5-year survival, respectively). Radiation therapy for head and neck cancer requires complex treatment planning that can vary considerably between institutions and physicians. In addition, significant short-term and long-term side effects can occur that require management by a carefully coordinated multidisciplinary care team. National Comprehensive Cancer Network (NCCN) guidelines recommend that head and neck cancer patients receive treatment at experienced centers, but whether provider experience affects outcomes was previously unknown. The research team used participation in previous RTOG head and neck cancer clinical trials as a surrogate for experience. They identified 88 low-accruing centers that enrolled an average of four patients yearly to the trials, and 13 high-accruing centers that enrolled an average of 65 patients annually. Next, the researchers compared outcomes based on whether patients were treated at the high-accruing (more experienced) or low-accruing (less experienced) centers. They found that 5-year local recurrence rates were higher among patients treated at less experienced centers versus more experienced centers (36% vs 21%). The radiation therapy plan was more likely to deviate from protocol at less experienced centers (18% vs 6%). Treatment at low-accruing centers was associated with a 91% increased risk of death and an 89% increase in progression or death when compared with high-accruing centers. Institutional elements not assessed by the study that can also influence outcomes included use of a tumor board, the number of colleagues and their years of practice, and ancillary services such as speech and swallowing therapy, diet and nutrition support, and specialized nursing. When it comes to specialized cancer surgery, it’s generally true that the more experienced the surgeon, the better the outcome. The same might hold true for radiation therapy used to treat head and neck cancer, according to a new study led by researchers Evan Wuthrick, MD, assistant professor of radiation oncology at The Ohio State University Comprehensive Cancer Center – Arthur G. James Cancer Hospital and Richard J. Solove Research Institute (OSUCCC – James), and Maura Gillison, MD, PhD, professor of internal medicine and epidemiology at the OSUCCC – James. Published in the Journal of Clinical Oncology with an accompanying editorial, the study compared survival and other outcomes in 470 patients treated with radiation therapy at 101 treatment centers through a clinical trial held from 2002 to 2005. The trial was sponsored by the National Cancer Institute and organized by the Radiation Therapy Oncology Group (RTOG). The findings indicated that patients treated at the less-experienced centers were more likely to have cancer recurrence (62 percent versus 42 percent at five years) and had poorer overall survival compared with those at the highly-experienced centers (51 percent versus 69 percent five-year survival, respectively). Radiation therapy for head and neck cancer requires complex treatment planning that can vary considerably between institutions and physicians. In addition, significant short-term and long-term side effects can occur that require management by a carefully coordinated multidisciplinary care team. National Comprehensive Cancer Network guidelines recommend that head and neck cancer patients receive treatment at experienced centers, but whether provider experience affects outcomes was previously unknown. Wuthrick, Gillison and their colleagues used participation in previous RTOG head and neck cancer clinical trials as a surrogate for experience. They identified 88 low-accruing centers that enrolled an average of four patients yearly to the trials, and 13 high-accruing centers that enrolled an average of 65 patients annually. Next, the researchers compared outcomes based on whether patients were treated at the high-accruing (more experienced) or low-accruing (less experienced) centers. Treatment at low-accruing centers was associated with a 91-percent increased risk of death and an 89-percent increase in progression or death when compared with high-accruing centers. Institutional elements not assessed by the study that can also influence outcomes included use of a tumor board, the number of colleagues and their years of practice, and ancillary services such as speech and swallowing therapy, dietetic and nutritional support, and specialized nursing. For the new study, 80 HPV-positive patients with stage III, or IVa,b squamous cell cancer of the oropharynx received inductionchemotherapy, including paclitaxel, cisplatin and cetuximab. The research was presented by lead author Anthony Cmelak, M.D., professor of Radiation Oncology at Vanderbilt-Ingram Cancer Center, during the 50th annual meeting of the American Society of Clinical Oncology (ASCO), held May 30 to June 3 in Chicago. The study focused on patients with newly diagnosed oropharyngeal cancers related to the human papilloma virus (HPV). More than two-thirds of new head and neck cancer patients have HPV-positive tumors and the number of these patients is on the rise. Cmelak’s prior study found that patients with HPV-positive oropharyngeal cancer have significantly longer survival rates than patients whose tumors are HPV negative. After chemotherapy, 62 of the patients showed no sign of cancer and were assigned to receive a 25 percent lower dose of intensity-modulated radiation therapy (IMRT) — an advanced technology that targets the radiation beam more accurately to treat the tumor without harming surrounding tissue. The rest of the patients received a standard IMRT dose. The drug cetuximab was also given to both groups of patients along with the IMRT treatment. The investigators concluded that patients with HPV-positive cancer who had excellent responses to induction chemotherapy followed by a reduced dose IMRT and cetuximab experienced high rates of tumor control and very low side effects, particularly for those with a minimal smoking history. Patients with HPV-positive squamous cell carcinoma of the oropharynx (SCCOP) had a longer time to development of distant metastasis (DM) after initial treatment, and had more metastatic sites in more atypical locations compared to HPV-negative patients, according to research presented today at the 2014 Multidisciplinary Head and Neck Cancer Symposium. Culled from records of an IRB-approved registry, the study reviewed 285 patients with stage III-IV SCCOP (originally thought to be a smoking-related head and neck cancer) treated with chemotherapy and radiation from 2002 to 2013. 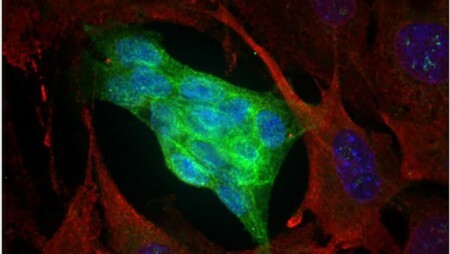 HPV status was determined by in situ hybridization for HPV DNA and/or by strong and diffuse (>75 percent) staining for p16 immunohistochemistry. There were 245 HPV-positive and 40 HPV-negative patients. Twenty-seven HPV-positive and eight HPV-negative patients failed with DM and were the subjects for more detailed evaluation. Radiation therapy (RT) was either 3-D RT (HPV-positive = 15/27; HPV-negative = 4/8) or intensity modulated radiation therapy (IMRT) (HPV-positive = 12/27; HPV-negative = 4/8) with doses from 66-79 Gy. Patients received concurrent chemotherapy of cisplatin (HPV-positive = 9/27; HPV-negative = 2/8), cisplatin/5 fluorouracil (FU) (HPV-positive = 10/27; HPV-negative = 3/8) or cetuximab (HPV-positive = 8/27; HPV-negative = 2/8). One HPV-negative patient received cisplatin/paclitaxel chemotherapy. One patient in each group was treated with adjuvant chemoradiotherapy after initial resection. Student t-tests were used to compare the difference between the means of the samples. Both HPV-positive and HPV-negative patients were found to have similar rates of DM, however the mean time to develop DM was significantly longer for HPV-positive patients (HPV-positive = 21.6 months vs. HPV-negative = 7.0 months). The most common sites of metastasis for all patients were the lung (HPV-positive = 17/27 vs. HPV-negative = 5/8) and bone (HPV-positive = 12/27 vs. HPV-negative = 2/8). The average number of metastatic subsites was significantly higher for HPV-positive patients (HPV-positive = 2.0 vs. HPV-negative = 1.1, p = 0.026). Twenty-one of 27 HPV-positive patients had more than one metastatic deposit, and 12/27 had DM involving more than one organ system, compared to only 1/8 for HPV-negative patients. Metastases in less typical sites were more common in HPV-positive patients; sites included the liver (6), intra-abdominal lymph nodes (3), brain (2), pleura (2) and peritoneum (1). Locoregional failure (metastases in the original tumor region) was only seen in four of the 27 HPV-positive patients, compared to three of the eight HPV-negative patients. The abstract, “Distant Metastatic Failure Patterns in Squamous Cell Cancer of the Oropharynx (SCCOP) Treated with Chemoradiation: the Impact of Human Papillomavirus,” will be presented in detail as a poster presentation at the 2014 Multidisciplinary Head and Neck Cancer Symposium. To speak with Dr. Trosman, contact Michelle Kirkwood on February 20 – 21, 2014 in the ASTRO Press Office at the JW Marriott Camelback Inn Resort and Spa in Scottsdale, Arizona at 480-596-7085 or email michellek@astro.org. Are combination therapies effective for advanced SCCHN? In a recent study, researchers from the University of North Carolina (UNC) Lineberger Comprehensive Cancer Center examined whether the addition of multiple drugs to radiation therapy is superior to the current standard of care therapy with one drug and radiation for locally advanced squamous cell carcinoma of the head and neck (SCCHN). Their data, published in the Journal of Clinical Oncology, suggests that it does not (March 4, 2013). Standard therapy for SCCHN is a combination of the drug cisplatin and radiotherapy. This clinical trial compared this combination to the combination with the addition of a small-molecule inhibitor of the epidermal growth factor receptor (EGFR) erlotinib. For the study, 204 patients with locally advanced SCCHN were recruited between December 2006 and October 2011. Participants were assigned to receive either cisplatin and radiotherapy or the same chemoradiotherapy with erlotinab. EGFR is a therapeutic target for this type of cancer, and at least one other EGFR is approved for multiple uses in treating head and neck cancer, including in combination with radiation. To date, no data have been published on the use of EGFR inhibitors in combination with chemotherapy and radiation. The goal of the current study was to determine if adding EGRF inhibition improved efficacy when combined with standard of care radiation. Unfortunately, the researchers found that the addition of EGRF did not improve clinical response rate or progression-free survival. Future investigations will rely more on patients selected by the molecular tumor characteristics, he added. Other institutions participating in the study were the University of Washington, Fred Hutchinson Cancer Research Center, Multicare Health Systems, University of New Mexico, Medical University of South Carolina, University of Miami, Coastal Carolina Radiation Oncology, and the University of Tennessee. Funding for the study was provided to the University of Washington by Genentech and Astellas Pharma Global Development.